Hello - I’d like to put in a feature request to set a preference for labelling photos by File Name instead of automatically by title upon importing. In the case where the photos have been downloaded from an archive website, all of the titles may be the same, depending on what the archive has chosen to do. In my file and folders, photos are listed sequentially by image number, but the metadata is just the archive name and box. So when Tropy imports them, they all have the same title. If you have an item, with say 30 pages of hand writing in another language, it can get very confusing very quickly to have identical file names for all 30 pages on Tropy. It’s impossible for example to quickly tell if the files have imported in the correct order. As Tropy often reverses the order of files upon importing, it would be nice to be able to verify that you as the researcher have rearranged everything is in the right order. As more archives put more material online, this issue will come up for other researchers as well. Add a preference that lets you pick which property should be populated with the filename on import at the item and photo level. And second checkbox to say you want to use the filename even if the file’s metadata include that property. Or add more or less the same options to the template (i.e., you could have different options based on your default template). Thanks! Either one of those options would be terrific! Also, I am thanking you in my book. Just a quick update to note that we added the new preferences in Tropy 1.4.2. In the preferences window, you can now decide into which field the filename (without extension) should be written. You can pick a field at the item- and the photo-level (if you don’t want to import the file name at all you can do so by clearing the respective selection). By default, data embedded in the photos (e.g., Exif, XMP, or IPTC fields) will always win. That is, if you normally save the file name as dc:title but the photo embeds dc:title the embedded value will be used by Troy; there is an additional checkbox to to indicate if, instead, you always want the file name to be used. So you should be able to solve the issue above now by either saving the file name to a different field, or by saving it to dc:title and overriding the embedded value. Many thanks! This is a terrific feature. 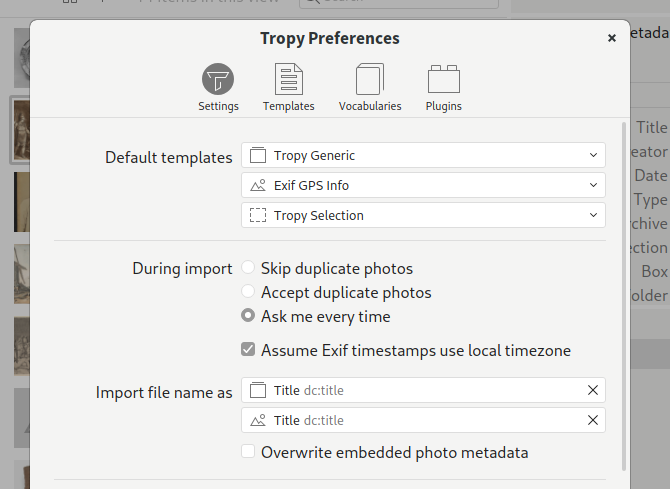 So just to clarify, what I need to do is simply check the Overwrite box and then Tropy will import my photos with the titles that I have given them in my files and folders? Thanks again for adding this feature. Hello, I think this might be related to my issue when importing images from mac Photos. I have been keeping my photos into mac Photos, organized into albums. Each photo has a title which is different from the file name. When I import them into Tropy, I want to keep the title instead of the file name. However, the photos are imported with a title that is neither the file name nor the title they have on mac Photos. For example, when I import a photo whose title is “Rif. 25, 1r” and whose file name is “IMG_7463.jpg” it shows on Tropy with the title of “fullsizeoutput_1c64” I have no idea where that comes from. We recommend that you not link directly between Apple’s Photos and Tropy. Photos.app stores photos in an obscure and changeable location, and when you link to a file that’s in that location, Photos.app changes the name of the file to that “fullsizeoutput” thing you’ve noted as well as monkeying with other metadata. Thank you so much for your reply. This is really good to know.